This is a visual metaphor. The demon is the point of the satire, and it is being killed by the big gun of right wing pundit’s obliviousness. Like most of the internet, I love to be outraged, and there’s nothing more I like to fly into a froth-at-the-mouth rage over than video games. Just as I was feeling the first stages of withdrawal a new reason to be red and furious presented itself: the Doom Eternal gameplay reveal. The footage shows the usual ballet of uber-violence and demonic gribblies, but getting upset over that stuff is ~so~ ‘90s. This time it was a line of background dialogue that led to the outbreak of outrage: ‘Remember: Demon can be an offensive term, please refer to our visitors as “mortally challenged.”’ However outrage might be over-stating it, what in fact happened was that a small group of people tweeted their concern that this line was an anti-immigrant dog whistle. Following this, another, much more outrage-hungry, and conservative group jumped on the former’s outrage and gleefully shoveled it up onto their media platforms. Hoping to stoke the gibbering reactionary engine that drives money to their Patreon accounts. And thus the latest gamer panic was born. Various reactionary pundits gleefully claim that Doom’s game developers, Id are satirising the left. They’re wrong. Wrong and stupid. Wrong, stupid, and they probably smell. 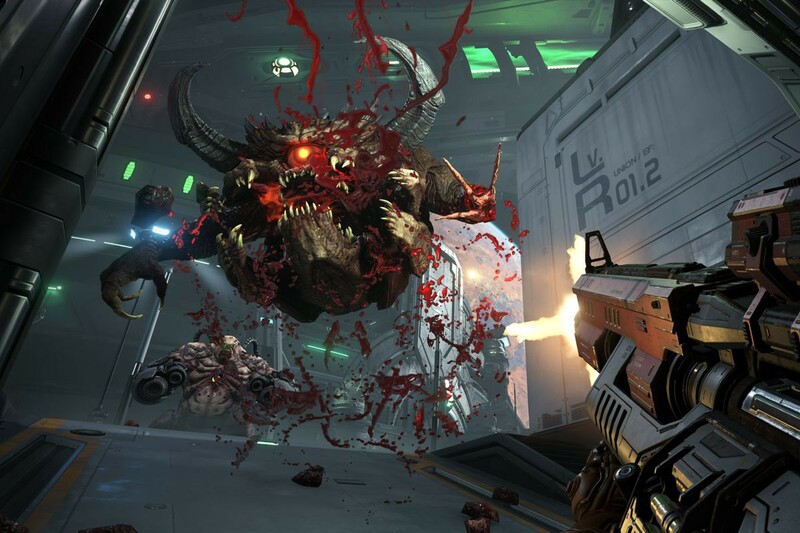 Doom is satirizing good old neoliberal, corporate Public Relations. You don’t become a right wing pundit unless you reject critical thinking and nuance. Huffing spray paint helps too. Doom has always been a game of few words. A few snippets of dialog can occasionally be heard as you murder your way trough the game. Most of this comes from the Union Aerospace Corporation holograms that serve as a corporate message board for the demon-infested installations of Mars. The hologram is a placid, blue figure who makes announcements who puts a corporate spin on macabre events, such as the requirement for volunteers for a mass sacrifice. This hologram puts a sanitised, soothing veneer over even the most grim announcements. Anyone who has worked for a large corporation will find it instantly familiar. 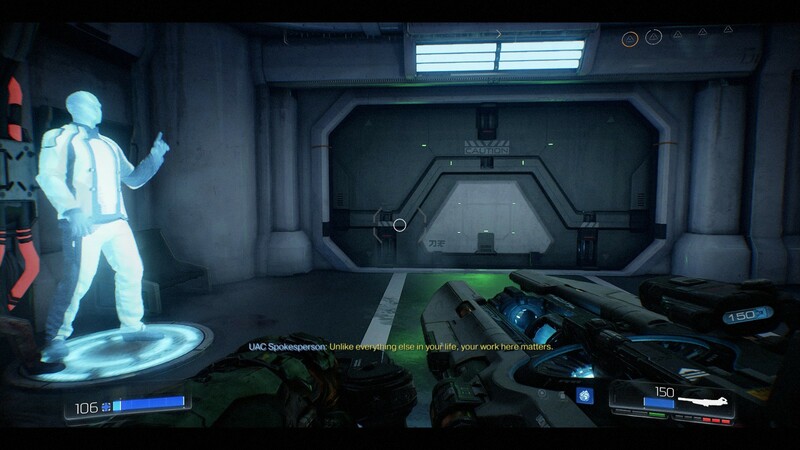 The UAC hologram appeared Doom Eternal gameplay footage, calmly reassuring the listener not to concern themselves with the slight changes to the environment (everything was now made of meat and on fire), to welcome the extra-dimensional super-fiends, and of course, the ‘mortally challenged’ line. The UAC are a monopolistic corporation with a single goal: Punching a hole through reality to allow a flood of demons through in the hopes that doing so will elevate the board to god-like immortals. The UAC have all the trappings of contemporary gigantic corporations. They have gigantic complexes devoted to research and development for government contracts, they have a huge staff who work in these contracts, and a board that reaps the profit, (both monetary and occult) of their worker’s hard work and (sometimes literal) sacrifice. The UAC also seems to have a PR department that tries to obfuscate their real objectives with a barrage of platitudes. 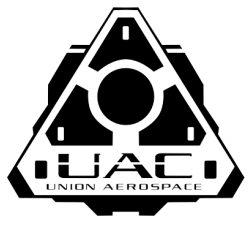 Despite the best efforts of the PR hologram, it’s pretty clear that the UAC is less than ethical. Subtle clues towards this can be found in the gore soaked ruins of their main installation on Mars. Corporations don’t value their workers, they see them as a means to an end. Whether that end be infernal power or simply a higher profit margin. They have to, or more unscrupulous corporations will out compete them. This thought is unpalatable, so many corporations put a lot of effort into hiding this. Elon Musk is the epitome of this (I have chosen him because Doom is set on Mars, just like his fruitless publicity stunts). Elon has managed to hide his hollow-eyed hunger for profit by going through great pains to portray himself as some kind of inventor-philanthropist. He tells his employees that they’re helping build a better future, that they’re part of his vision. In reality his workers are reified cogs in his machine, a machine that is solely meant to enrich him. He will lay off as many workers as he needs, he will dodge as many taxes as he can, he will funnel as much money into the Republican party as he deems fit. All of this is solely to increase his personal wealth. 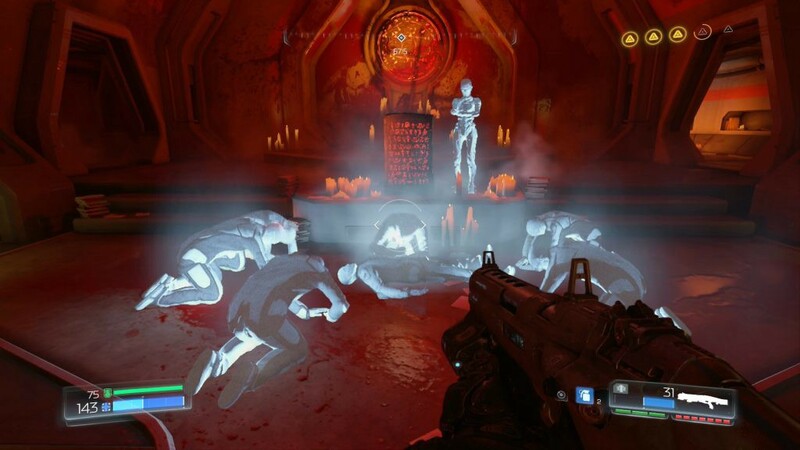 This exploitative relationship is turned into an extreme caricature of itself in Doom, with staff being literal fodder for infernal powers. The workers (both real and digital) aren’t exactly being held hostage, they are, in many cases, complicit. They have bought into the PR from the blue hologram and Elon’s blue check-marked account. They fully believe that their employers have their best intentions in mind. This relationship can be seen in the various shrines dotting the Mars facility in Doom, and the toady tweets Elon basks in everyday. Both of the above are identical to me. Don’t try to change my mind. It is this that Id is satirising. 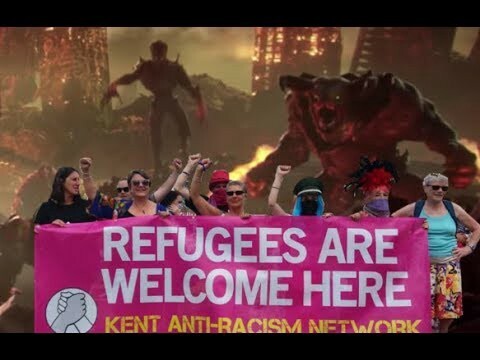 They aren’t swinging at the left, they aren’t sniping at refugees, they are poking fun at the platitudes your employer feeds you as they pick your pocket and use you up. So, now you can appreciate the satire in the loud-shooty game properly. Tall boy writer with nice hair.